Thanks for the great review, Jane. It was a pleasure serving you as a customer. Great customer service. Good location. Last minute emergency to pack a school guitar amp for next day flight for school band trip. These guys so helpful over phone and asked me to bring in so they could help me pack it. Friendly "Can-do" staff with all the right resources. Thankyou so much! A great service provided at very reasonable rates. Would definitely recommend. Service was as expected however an admin error on their part saw invoices directed to an incorrect email address. A refusal by the manager, Shannon, to refund a $22 late payment fee has left a sour taste in my mouth from the short term rental arrangement. I have resorted to sharing the experience as they have not acknowledged the error as theirs and have claimed to be unable to process a refund as the agreement has ended. More like unwilling! It isn't about the $22. Hopefully this review turns one person to an alternative provider and in turn pulls the $22 of revenue out of their books. Easy access to units. Staff are friendly and helpful. Great staff and a huge range. Location is a little annoying to get to. but all in all great place to get what you need. Very reliable, friendly service that ties in perfectly with my business needs ....Security! which is A1 with plenty of camera's and motion detection on every locker giving me piece of mind. The staff at Storage King Greensborough are very professional, welcoming and helpful in all areas involved in renting storage. I am most happy storing my trailer with them. I have used Storage King Greensborough for 4 months each year over the last 4 years to store photos and documents during the fire danger season.The staff and facilities have been excellent. Helpful staff with dry, clean units. Easy access and very secure. Great friendly service, Staysea made it easy. Very satisfying experience. Staff are friendly and helpful, and storage is easy to access, straightforward and clearly secure. Even the smaller sized room was more than enough! The process was quick and easy, and the staff were very friendly. Jenny was great and she showed me how to do everything. Having access to the free truck saved us money and really helped us out. Great job and many thanks!! From the very first phone call to removing our household items, I found the service provided by Sue, Jodie and Jenny absolutely fantastic. The manual turbo diesel truck was a pleasure to drive to enable us to de-clutter our house for sale. The space required was shown to me, so we could best decide what we needed. We chose 3m x 3m x 3m with a lockable roller door. Spotlessly clean, well light for night access and very secure. I thoroughly recommend use of Storage King Greensborough as the very nice staff there made it so much less stressful, and with the 1st month free and cold drinks on hand - it was very hot at that time, it was truly a most pleasant experience from beginning to end. Also contacts for removalists and Avis and Thrifty van discounts - all added to the great service. Thank you very much to the ladies there as they truly do a splendid job. 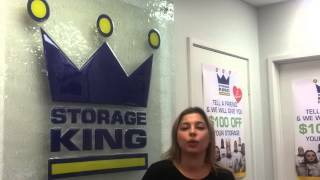 Welcome to Storage King Greensborough. Let us take the stress out of moving for you. We offer a large range of sizes and storage options whether it's for home or business, Short or long term Our drive through purpose built facility offers state of the art security with 7 day access 365 days of the year. We have everything you need to pack and store your goods with a large range of boxes and packaging supplies available. Save time and money by utilizing our courtesy move in truck fully equipped with a hydraulic tailgate and fridge trolley. 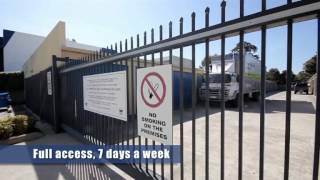 Storage King Greensborough proudly services Briar Hill, Eltham North, Eltham, Montmorency, Watsonia and Bundoora.